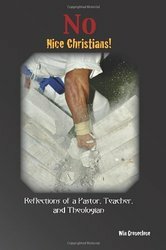 No Nice Christians is a series of reflections and short studies – and while they are on varied topics, they are designed to set forth some ideas about the life of the Christian and the Church that challenges many of the status-quo’s that sometimes find root. This is a series of essays centered around the four themes noted above. It was written in connection with speaking at the Wings of Life, International Leadership Conference in Nairobi, Kenya. Though this was originally written for East-African Pastors, there is much pastoral theology within that applies to pastors anywhere in the world.